If you're thinking of entering a hot chili pepper eating contest, you might want to think twice, doctors caution. Their warning comes after treating a young man in the hospital who suffered excruciatingly painful headaches after eating a "Carolina Reaper," long considered the world's hottest chili pepper. In a case study published in the journal BMJ Case Reports, doctors describe a 34-year-old man who came to the emergency room after the onset of a thunderclap headache -- a severe and sudden pain in the head. The pain began with dry heaves immediately after eating the chili pepper. "It started all of a sudden as severe pain in the back of the neck and then spread to all over the head," study author Dr. Kulothungan Gunasekaran, of Henry Ford Hospital in Detroit, told CBS News. "That's typical of a thunderclap headache." Over the next few days, the man kept getting these brief but excruciating headaches. They only lasted a few seconds each, but the pain was so severe he went to the ER. Gunasekaran was one of several doctors who treated him. The patient was tested for various neurological conditions, but the results came back negative. Then a CT scan showed several of the man's arteries in his brain had constricted, which led to a diagnosis of reversible cerebral vasoconstriction syndrome, or RCVS. This condition is characterized by a temporary narrowing of the arteries accompanied by a thunderclap headache. It doesn't always have a specific cause, but it can be brought on by certain prescription medications or after taking illegal drugs. This is the first case to be associated with eating chili peppers. Neurologist Dr. Gregory H. Cummings made the diagnosis after reviewing scientific literature and finding that eating cayenne pepper has been linked to sudden constriction of the coronary artery and even heart attacks. 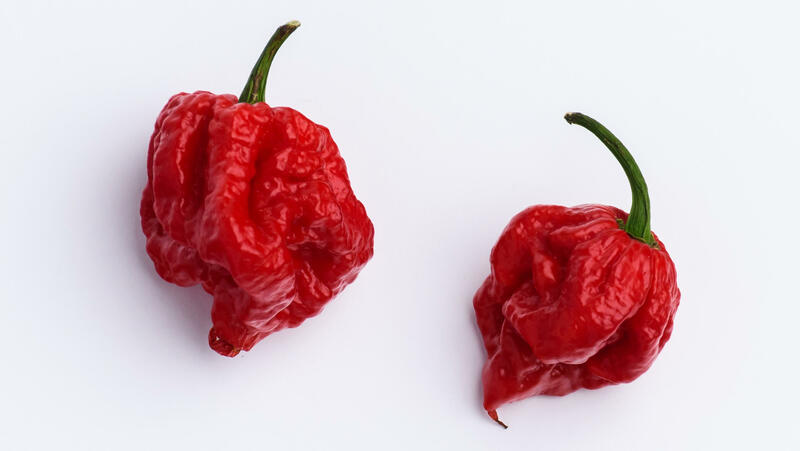 "Given the development of symptoms immediately after exposure to a known vasoactive substance [substances that cause constriction of blood vessels], it is plausible that our patient had RCVS secondary to the Carolina Reaper," the authors wrote. The patient's symptoms cleared up on their own and a follow-up scan five weeks later showed the affected arteries had returned to their normal width. Doctors say the case report should make other health care providers aware that RCVS can be brought on by eating chili peppers. Consumers should also be vigilant about the risks if they attempt to eat a Carolina Reaper, Gunasekaran cautions. "For people who eat this chili pepper and then experience these symptoms, this kind of thunderclap headache, seek medical attention as soon as possible," he said, "because while our patient came out of this with no issues, in very rare cases RCVS can lead to stroke." The Carolina Reaper scores a sky-high 1.6 million on the Scoville heat scale, which measures the concentration of capsaicin in peppers. It held the Guinness Book of World Records title for world's hottest pepper until a challenger called the Dragon's Breath came along last year with a 2.48 million on the Scoville scale.